To complement the written notations, there is a collection of video footage on YouTube of OSB performing; a link to one (or more) video clips is provided at the beginning of the notation for each dance in the workbook. A glossary of the terminology and abbreviations is also included, and we name the tunes we use for each dance. The workbook is also available in electronic and hard copy in the archives of the EFDSS' Vaughan Williams Library, and the National Centre for Folk Arts Library at Halsway Manor. We hope that you find a dance, or several, from the OSB repertoire that you would like to try. If you do then please feel free to go ahead. All we ask is that it is formally acknowledged as a ‘One Step Beyond dance’ each time you perform it or teach it. 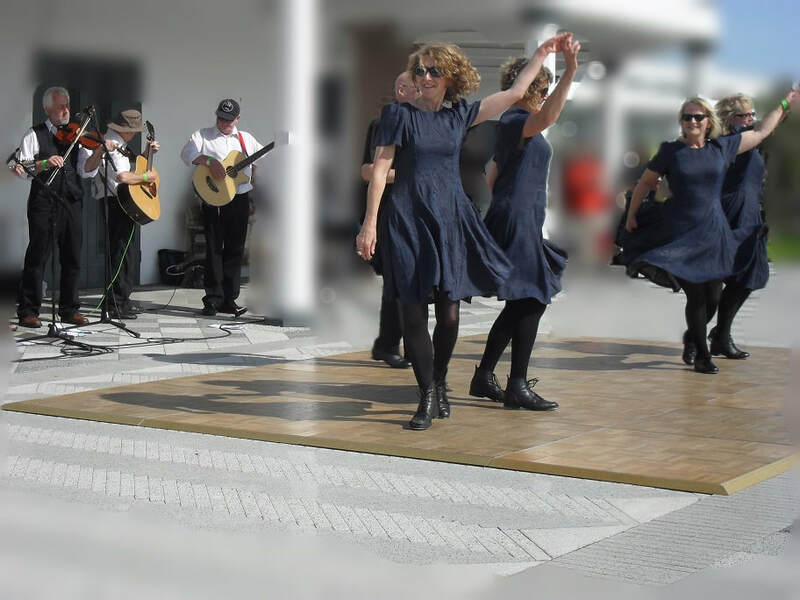 One Step Beyond (OSB) is the performance name of a group of dancers and musicians from the Worcestershire and West Midlands regions of the UK. We started life in 1988 after being inspired by the Appalachian dance performances we had seen at various events and festivals. For various reasons, but primarily the desire to finish at peak performance level, we made the hard decision to ‘hang up our boots’ in 2012, but some dancers and musicians remain available to provide workshops. Our significant repertoire of fast paced and highly visual dances in the Appalachian style, percussive acappella routines and contra rhythms was devised and choreographed by the group and our Dance Director. They are unique to One Step Beyond. You’ll find a bit more about One Step Beyond, our dances and our dance style in the short biography included at the beginning of the workbook. We hope you enjoy our dances as much as we did!